Our family consists of 8 children with ages ranging between 4 and 15 years. Because of the above, it was challenging to find a balance in teaching the Word of God in one sitting. As we have been serving at Bethesda since 2014 as house parents, it has been our heart cry to get the right material to cater for all our kids in a single sitting as some of the topics that were directed to the bigger children seemed complicated to the little ones; whereas, the topics for the little ones seemed boring to the bigger ones. We thank God that He gave us ideas and friends along the way who helped with family devotional materials. One such example is a 10-minute devotional book titled, Old Story New by Marty Machowski. This book was given to us as a gift from two of our missionary colleagues. After a recommendation from one of our missionary friends who have been using this tool for their family devotions, we decided to give it a try. Both the kids and we have been positively affected by this devotional book as at the end of each topic it is pointing us to the Cross. The children are literally “competing” to pray, reading the Bible verses and answering questions. It is a good competition though. Besides this book, we do share simple short Christian character topics for obedient behavior and what God expects in their life such as how to respect others, how to care for the environment and property, how to keep the play areas and other rooms in the house in order and clean etc. We are thankful to God that the 4 older children have confessed Christ as their Lord and Savior. We want to admit that it is a journey but as their parents we can evidently see their hearts being drawn closer to the Lord. They are all participating in Sunday school and the teenagers are attending the weekly youth meetings being held at our church. We are also thankful that some of our colleagues are testifying that the conduct of some of our kids are changing positively. All we can say is ALL the glory be to God. We would like to encourage other parents that when it comes to family devotions, there is need for proper planning by prayer and meditation on the Word of God. We realize that this is a spiritual battle for the souls of the children to make them disciples of Christ as there are so many influences and worldly pleasures drawing them away from the Truth. It is because of this that we should take every opportunity to plant the seed of the Word of God. It may look like nothing is happening, but that seed will surely germinate as the Word of God shall not go out void until it has accomplished that which it has been sent to. (Isaiah 55 v 9-11). In conclusion, we would like to thank God for placing us at Bethesda Outreach as house parents, a role which is helping us to grow each day as God deals with our own hearts as His children as well as that of the kids He has placed under our care. Please continue praying for us to constantly discern and apply wisdom as we deal with each child according to the Scriptures. Pray for the children who are born again to desire the spiritual milk of the Word of God and that they may each grow in the grace and knowledge of the Lord Jesus Christ. Last but not the least, pray for the little kids that they will come to know Christ at a tender age. 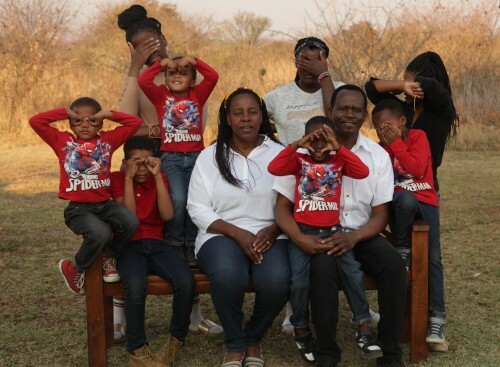 Alex and Mutinta Phiri have been houseparents at Bethesda since 2014. 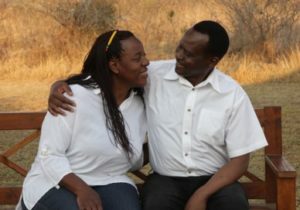 They, along with their daughter have moved here from Zambia. Alex is currently a dad to 8 wonderful and crazy kids as well as a teacher in our primary school. Mutinta is an incredible mom, cook, counselor to our children and a tremendous help to our child care programme.